Click on this image to find out! They offer a neutral and independent space for the exploration of ideas free from associations with a single agenda or group/institution. Creative practice is an integral part as a means for opening up dialogue and generating new ideas. They are inclusive – participants come from a broad spectrum of practices, working lives, ages and backgrounds and difference is prioritised with invitations and design. 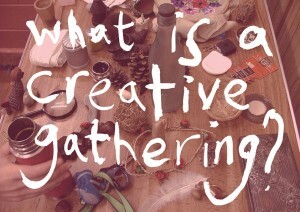 Creative Gatherings can influence a different kind of conversation through ‘holding’ a space that contains tensions and opposing views within it and yet, are flexible and inviting enough for participants to maintain that flexibility. Sharing food is also a common factor in encouraging new ways of working and sharing ideas more directly. A recent example of this approach can be found in this case study from the RSA’s Citizen Power Peterborough. 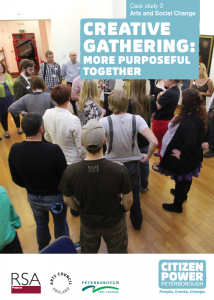 Have a look at the Facebook created for the Arts and Social Change programme in RSA Wiltshire.